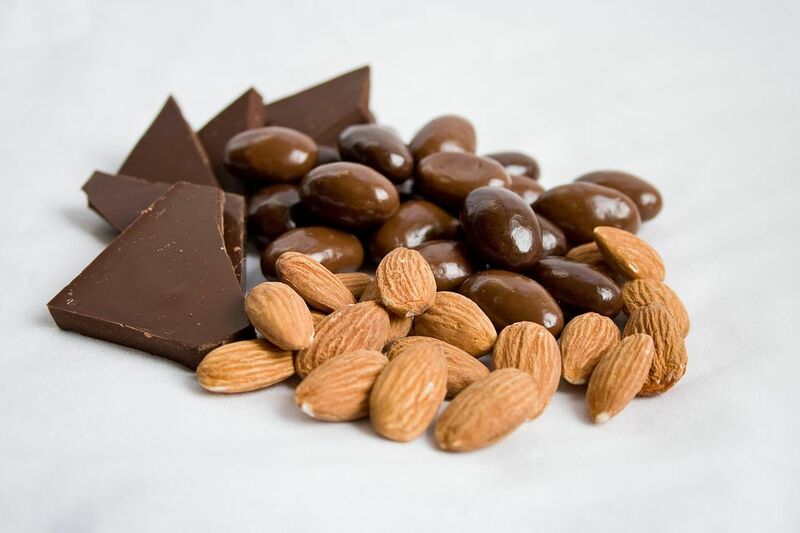 Sugar-free chocolate and nuts are mixed to make these easy, delicious cluster candies. I like using almonds and cashews, but you can substitute any nuts you prefer. Be sure to buy "diabetic" or "sugar-free" chocolate (made with sugar substitutes), not unsweetened chocolate. Prepare a baking sheet by lining it with aluminum foil. Chop the sugar-free chocolate into small pieces and place it in a microwave-safe bowl. Microwave until melted, stirring after every 45 seconds to prevent overheating. Remove from the microwave when the chocolate is mostly melted, and continue stirring until it is entirely melted and smooth. Pour the nuts on top of the melted chocolate, and stir until the candy is well-mixed and all the pieces are coated. Using a teaspoon, drop small spoonfuls of candy onto the prepared baking sheet. This recipe will make approximately 2 dozen 1-inch clusters. If desired, top each cluster with a decorative nut half while the chocolate is still wet. Place the candy in the refrigerator for 20 minutes to set the chocolate. Store in an airtight container in the refrigerator for up to a week.